Dillon Moore Wedgewood Productions Inc. I own and can operate: Protool 12 HD, Waves and Izotope RX 5. Genelec 8010, KRK VXT8 and Focusrite. 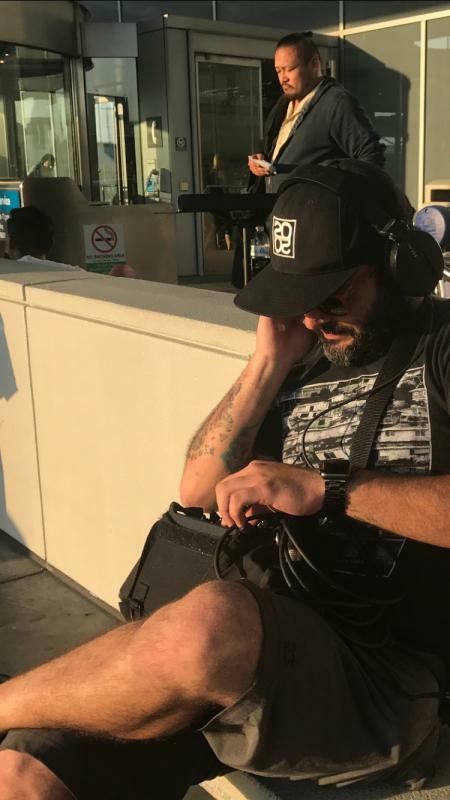 My name is Juan Pablo Moreu, I am a bilingual Sound Mixer / Sound Recordist / Sound Editor and Designer. I have 8 years of experience in Audio Engineering and over 5 years of experience working in Sound Mixing, Recording and Design for film, interviews, live shows, reality shows, sports documentaries and news for television companies and production companies. As a Sound Mixer, I have worked several local sound recordings and done remote sound editing and sound design. Major projects that I covered in the past year are a three episode documentary for CBS sports (Sound Design and Edit), 1 documentary in earthquakes for the Earth Observatory of Singapore / Nanyang Technological University (Sound Recording / Boom Operator), 1 corporate interview in Hawaii for eFlorist / Teleflora (Sound Recordist / Boom Operator) and 2 internet talk shows interviewing artist, one of them was a 6 episode recording for TBS online (Sound Mixer / Recordist) and 2 episodes for Sidewalk Films / Adult Swim (Sound Recordist / Boom Operator) 2 Horror films (Sound Editor / Sound Designer) and a documentary for The Go Big Project / Mercedes Benz "Big Wave Surfing Red Chargers" (Sound Editor / Sound Designer). At the moment I work as a A1/Independent Contractor for Flosports and as a Independent Contractor as a Sound Mixer / Sound Designer / Sound Editor / Video Editor. I used to work also as a full time Broadcast Mixing Engineer/Board Operator/A1 for Univision Communications Network in Miami, FL. Also, I recently finished a 5 week recording of a documentary about Jelly Ball Fishing in Darien, GA and in the Atlantic Ocean. I am a one man band who records, mixes and boom. I have done Sound Mixing and Sound Recordings in New York, NY; Las Vegas, NV; Miami, FL; Barcelona, Spain; San Juan, PR; Kapalua, HI; Darien, GA / Atlantic Ocean; Los Angeles, CA. "Ferrari 458 Italia Video Sizzle"
Sound Mixer Boom Op in location and the Sound Designer in Post Production. - Interview for "Living with Disaster"
MP3 Sample is my latest recording in Darien, GA / Atlantic Ocean. Jelly Ball Fishing Documentary. Information about more equipment, samples or references are available upon request.